Who’s ready for another makeup dupes post? Some of my drugstore and dupes posts are my most viewed posts, especially via Pinterest! 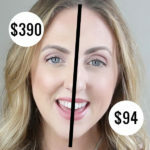 In fact, my Full Face of Makeup Dupes post is one of my most popular posts of all time! Today we’ll be talking all about some amazing makeup primer dupes! Primer is one step I just can’t skip in my routine. I vary up the primers I use depending on the look I’m going for, whether I am going for a blurring, matte, or dewy look. I love me some good high-end primers and have used so many of them over the years, but of course, I am always searching for a dupe! These makeup primer dupes have been tested by yours truly. I would confidently recommend each and every one of these dupes if you are on a budget but want something similar to its high-end counterpart. Some of these primers are not 100% identical in the way that they feel right away, but do the same thing on the skin. For me, I consider that a good dupe. Performance is what matters at the end of the day! Let’s battle this out! I’ve also linked every high-end primer at Sephora and every dupe at Amazon, to make it easy for you to shop. One thing I’ve noticed lately is that Amazon is killing it with their prices of drugstore beauty… sometimes a few dollars less than what I see it in stores! The Smashbox Photo Finish Primer is a cult favorite, and kind of the standard primer everyone seems to compare other primers with. It’s got a silky silicone texture that creates a poreless base for the makeup to glide onto. If I’m being completely honest here, there are so many primers out there just like this for the fraction of the price. If you’ve never tried the Maybelline Baby Skin Primer, add it to your cart! It’s the cheapest dead on dupe I’ve found. I previously mentioned it in my Drugstore Makeup Dupes post. I cannot tell a difference! Another dupe is the Monistat Chafing Relief Powder-Gel – it is also nearly identical but a little bit more expensive. That’s why the Baby Skin wins! The Hourglass Veil Mineral Primer has a very silky texture that creates a really soft canvas for makeup. In my opinion, it isn’t as blurring as some other pore-filling primers, but it is a beautiful makeup base. NYX Angel Veil Primer is nearly identical! The texture is not quite the same when you first squeeze it out of the tube, but once it’s spread on the face, it creates the same feel and finish. I absolutely love it as a dupe to the Hourglass. Side note: why is Hourglass so pricey? In my Full Face of Makeup Dupes post/video, I did a side by side comparison of these two primers. The Becca Backlight Priming Filter is so pricey, but it is gorgeous! If you have dry skin or want a luminous primer that leaves a healthy glow, you will love it. I was completely shocked to find that the Maybelline Master Prime Blur + Illuminate is a dead-on dupe. The only difference is a slight shade difference, which completely blends out and is not noticeable once it’s on the skin. This is my favorite makeup primer dupe of the bunch. You have to try it! I’ve gotta say, the Benefit Porefessional Primer is hard to dupe. I’ve tried so many different primers to find that similar consistency, but just haven’t found the perfect one yet. The next best thing, in my opinion, is to have something that performs on the skin as closely as possible. The best I’ve found is the e.l.f. Poreless Face Primer (side note: this is super cheap on Amazon… way cheaper than $6. Click that link to check it!). The consistency is different than the Porefessional, but it blurs the exact same way. I am super impressed every single time I use it! Hope you found these makeup primer dupes helpful! I know they sure will be a help to your wallet. Do you have any favorite drugstore primers you love more than any other high-end brand? I’d love to know! If you found this post helpful and you’d like to share it with your friends, I’d love if you’d pin this image below! Thank you so much! Which makeup primer dupe are you going to try first? 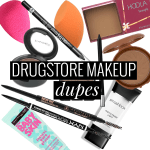 …or check out all of my drugstore/dupes posts HERE! I LOVE that ELF primer!! It’s amazing and is the closest to the benefit. The Maybelline Baby Skin is my go to primer, I love the feeling. It also doesn’t break me out either. Great dupes Meg! So good, right?!! I love it!! Thanks girl!! I’ve been thinking about buying one of those, which one do you like better? The elf one or baby skin? What would you suggest for an eye primer? Pore-fessional is one of my favorites; I’m excited to try the ELF to see if it works just as well for me and saves a little in the budget. I love the maybelline super stay foundation as a dupe to urban decay up all night! Which one would be best for oily skin?